The team at Dale Carnegie Training knows that How to Win Friends and Influence People is a global business classic; originally selling a few thousand copies with its first printing 78 years ago, Dale Carnegie’s rock-solid and time tested advice has moved thousands and thousands of successful business professionals to even greater success. Published the same year as the completion of the Hoover Dam, in 1936, this important leadership book has helped thousands and thousands of professionals for decades. Popular across the globe and in print in many languages, it is a still an extremely powerful read. Every leader across New Jersey needs to have it on their office shelf. The reason for the book’s continued success is its profound impact on both leadership and management and its ability to improve professional lives. 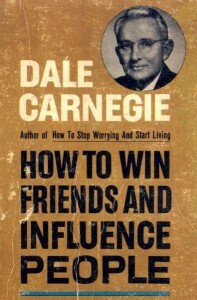 In his career, Mr. Dale Carnegie had the unique ability to continuously improve his message until his passing in 1955. He truly understood the changes leadership and business go through as time changes. Relationships and employee engagement are both in constant change. The ability to know progress is not a constant but a variable is important to understand and is essential to success. This book’s focus on creating new thoughts and new ways of thinking helps create solid leadership. Managers must promote both loyalty and enthusiasm in these still challenging times. Understanding the workforce and promoting opportunity facilitates both progress and success. How to Win Friends and Influence People is the very first book to focus on the challenges and the strategies of human communication. There is great power in this approach to get things done in the workplace and within our personal lives. First written as the textbook for Dale Carnegie’s early classes, it is still used today in the Effective Speaking and Human Relations sessions all around the world. For almost 80 years, it continues to be the first and the best book of its kind that leads organizations to success and profitability!